A look from over the Christmas holiday. I adore my polka dot Brahmin bag and have it out on display in my office. It's just so darn cute! LOVING these pants... they seem intimidating at first, but you serious rock them in a very beautiful but practical way! I may have to snag a pair in '12! love the color and simple cut of the coat and i like the look of the paige legging jeans. the leather front panel is a nice detail! This little bag is adorable! That coat is so flattering on you! Just bought a similar darling bag from Aldo. So cute on you! I love that bag! But also the camel colored jacket! Gorgeous! The coat and the purse compliment each other so well! Great outfit. Love the polka bag. So cute. That bag is incredible. !!! Amazing outfit today! I love the pants (I have a similar pair). They look great paired with the camel coat and polka dotted purse! You nailed it: simple and classic. Hey! I want that bag... LOL! Love this coat with an all black look , very sheek! love this look! especially those paige pants! Absolutely stunning outfit!! You're gorgeous! I LOVE your the shade of pink of your lipstick! What is it? Totally love how you've put this outfit together, I could quite happily take all of them into my wardrobe!! That really IS cute!!! I love it! <3 You have the best style. Happy New YEar! 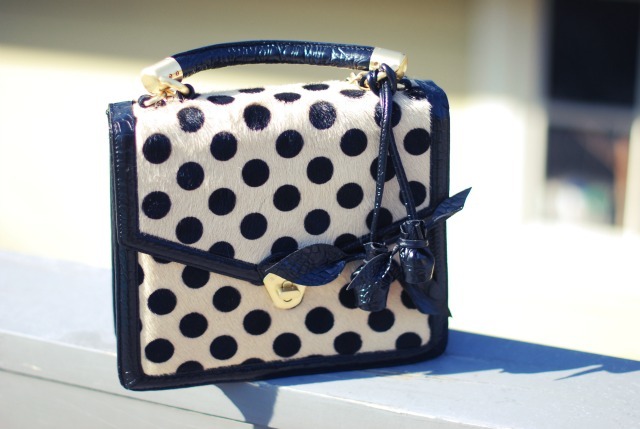 the polka dot handbag is TOO cute! and I am absolutely lusting over the leather leggings....I need a pair! Loving your post today- the whole look is amazing. I'm obsessed with that bag. So.Dang.Cute! You look beautiful... That coat is to die for! Happy new year! Such an adorable bag! I am loving your pants as well. So unique! Oh this is utterly cute bag, so sweet miniature! :) U look very lovely!! p.s. Happy New 2012 and best wishes!! That is one adorable bag! It totally makes this outfit. i love your bag a pretty good choice in my opinion! Ohh, that bag! <3 <3 <3 I am obsessing over the dotted print! i would have it on display too! so cute! Great bag and coat combo! You look great..love the bag & coat! Happy new year! Such an adorable bag! Fab jeans too. Great outfit, love that bag! The bag is absolutely adorable. That purchase was a definite score. The bag is gorgeous! And so are you! Nice bag! Love the shape and the dots are so cute. oh my gosh, that bag! LOVE! super cute look--I LOVE your pants!! You look stunning and that bag is absolutely adorable!! Your little bag is so cute!! that is the cuttttest bag! beautiful Taylor! I love how classic this outfit is. love that the bag makes your outfit pop! Oh that purse! Cuteness overload! You look gorgeous and I adore the leather pants + girly bag combo! My fav. Taylor, I'm simply in love with your ladylike little coat! I absolutely love the pants and purse!! Been looking everywhere for something like those! Thank you for always posting! You are an inspiration :) Happy New Years! What a cute cute purse! And love those leggings! Happy New Year Taylor! Haha that is the cutest little animal print bag! love love love everything about that coat!! Love the bag and pants! These pants are to die for! I have been dying to find something like these or with the tuxedo stripe. Any suggestions for pants that fit a 5'2 petite girl? Oh so cute! I've been wanting a polka dot bag. You have a beautiful smile. I love the lipstick you're wearing too. I'm crazy about those leggings and the purse!! Taylor, I absolutely love this! You look gorgeous - you are smokin' in those pants and the bag is darling! Happy New Year! That purse sure is adorable! I can't even tell how much I love polka dots! This bag ads a nice to twist to this classic outfit. Such a fun handbag! It's like it smiles for you! I swear I'm such a sucker for anything polka dot. I love that bag. So unique. You have an amazing style! You always look put together. The purse is so cute. I just love those legging! Love your wool coat and love the two-toned pants that look so glam and leather-y. Great outfit! Love the bag... it's darling. I love your bag. very vintage and cute. I love your outfit, super classic and chic! I am obsessing over that bag!